Laura Austin captured this stunning image of the ISS streaking through Orion's Belt on Sept. 10, 2015 from Sarnia, Ontaria, Canada. 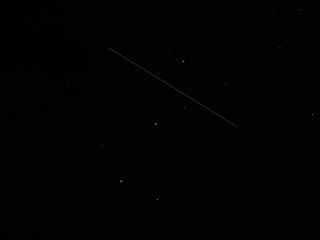 The International Space Station hurled through Orion's Belt in this image captured by Laura Austin. Austin snapped this well-timed image on Sept. 10 from Sarnia, Ontaria, Canada. For Austin, any viewing of the space station is a special moment. The International Space Station is a permanently occupied outpost in outer space, serving as a laboratory for new technologies and an observation platform for astronomical, environmental and geological research. It flies at an average altitude of 248 miles (400 kilometers) above Earth circling the globe every 90 minutes at a speed of about 17,500 mph (28,000 km/h). In one day, the station travels about the distance it would take to go from Earth to the moon and back. It can be seen from Earth without the use of a telescope by night sky observers. Editor's note: If you have an amazing night sky photo you'd like to share with us and our news partners for a possible story or image gallery, send images and comments to Managing Editor Tariq Malik at spacephotos@space.com.